B.A. 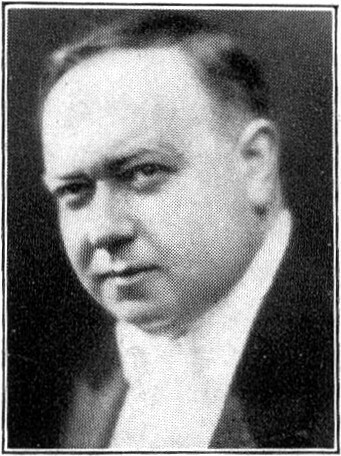 Rolfe, as pictured in a 1932 publication. Thomas A. Edison’s “Needle Type Electric” records—sometimes called “thin” Edisons for reasons self explanatory—were his last hurrah in the record business, before bidding the industry farewell forever. Unlike his vertically cut, quarter-of-an-inch thick Diamond Discs, they were plain, ordinary shellac 78s, which could be played on any Victrola or like talking machine. The completely redesigned labels—with an array of lightning bolts striking from the top, framing the name “Edison”, emblazoned in bold, block lettering—represent the pinnacle of late-1920s commercial art. Thus, like any of the countless extremely short-lived record lines (e.g. Black Patti, Timely Tunes, Sunrise, etc.—all of which, incidentally, also had beautifully designed labels), they are quite uncommon today. First up, the famed B. 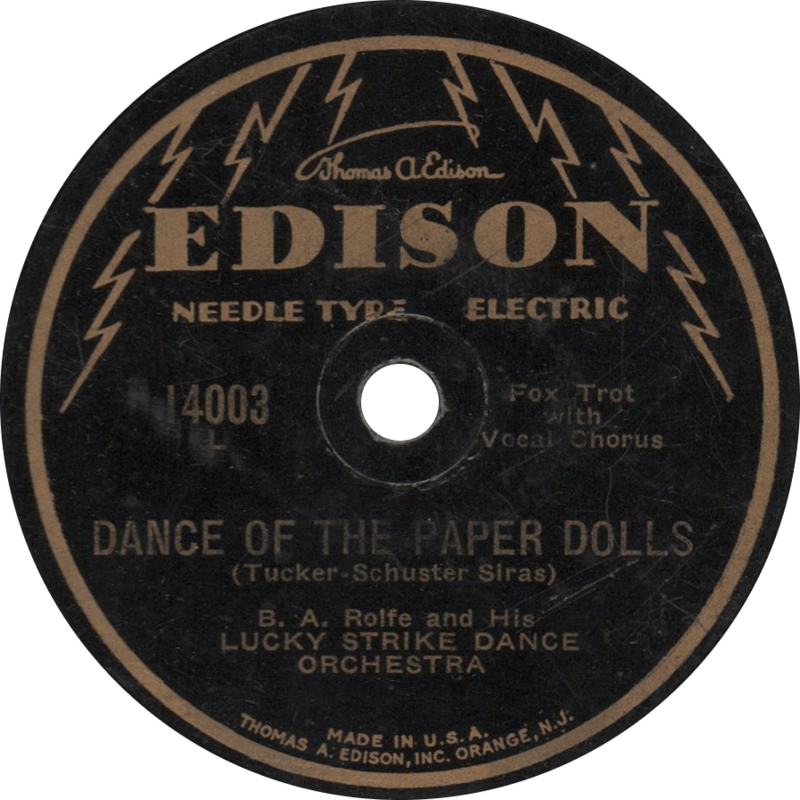 A. Rolfe and his Lucky Strike Dance Orchestra plays “Dance of the Paper Dolls” and “Fioretta”, both sides featuring vocals provided by an uncredited Jack Parker. Born on October 24, 1879, Benjamin Albert Rolfe, known in earlier life as the “Boy Trumpet Wonder” was a trumpet prodigy who went on to become a popular radio bandleader and Edison recording artist. During the 1910s and ’20s, Rolfe spent a stretch as a Hollywood movie producer, following which he established his distinguished career as a bandleader. Notably. he directed his “Palais D’or Orchestra”—named for his own Broadway cabaret—from 1926 until 1928, at which point it became the “Lucky Strike Dance Orchestra” for the remainder of his time with Edison. Rolfe remained a radio mainstay into the 1930s, appearing in a pair of Vitaphone short films, and leading the B.F. Goodrich Silvertown Orchestra in 1935 and ’36. B.A. Rolfe died of cancer on April 23, 1956. Edison 14003 was recorded on March 19, 1929 in New York City. Both tunes also appeared on separate Diamond Discs, as the “R” side of their respective discs. This Needle Type record provides a somewhat uncommon opportunity to hear Rolfe’s orchestra on a standard laterally cut phonograph record. First up is “Dance of the Paper Dolls”, which also appeared on Diamond Disc 52548, backed with “Hello Sweetie”. Dance of the Paper Dolls, recorded on March 19, 1929 by B. A. Rolfe and his Lucky Strike Dance Orchestra. 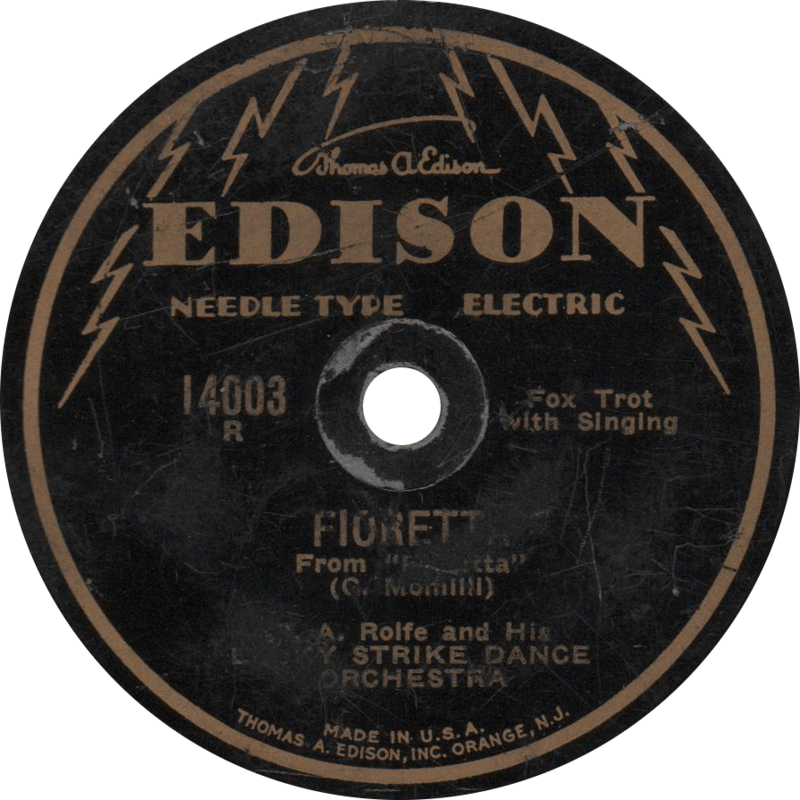 On the “R” side, Rolfe’s orchestra plays “Fioretta”, from the 1929 Broadway musical of the same name. This disc, unfortunately, is a little moisture damaged, causing some noticeable “swishing.” This one was also issued on Diamond Disc 52531, backed with “If I Had You”. Fioretta, recorded on March 19, 1929 by B. A. Rolfe and his Lucky Strike Dance Orchestra. Next up is another Edison dance band on Edison 14041, recorded on July 18, 1929, also in New York City. The Hotel Commodore Dance Orchestra (under the direction of violinist Bernhard Lewitow) first plays “Where the Sweet Forget-Me-Nots Remember” I’m not sure who the vocalist is on this one, so if anyone could tip me off, I’d be much obliged. 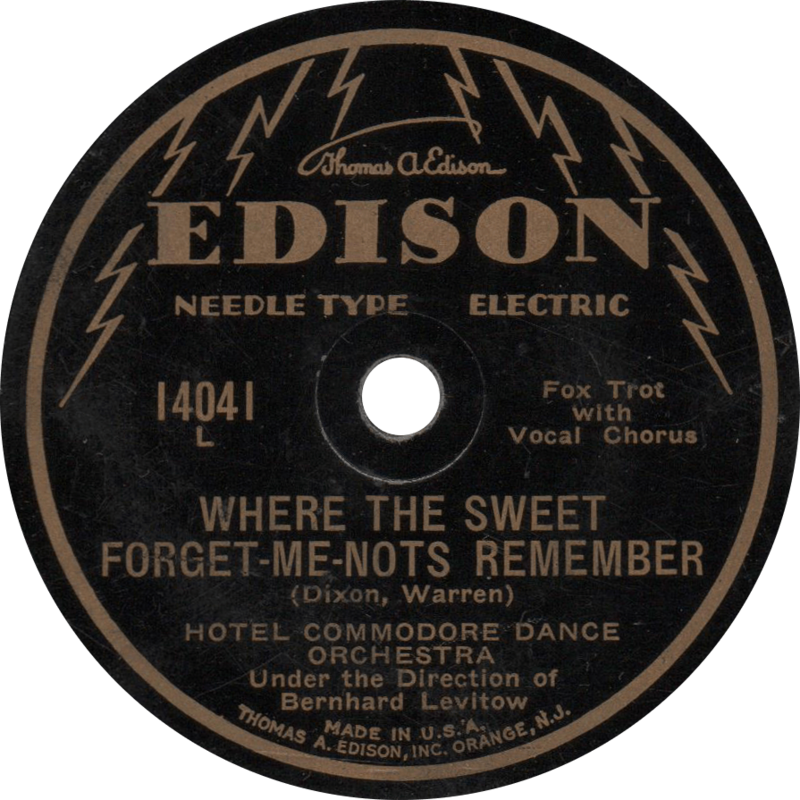 Where the Sweet Forget-Me-Nots Remember, recorded July 18, 1929 by Hotel Commodore Dance Orchestra Under the Direction of Bernhard Levitow. On the reverse, they play “Smiling Irish Eyes”, from the 1929 Warner Bros. Vitaphone talkie of the same name, starring Colleen Moore, now a lost film. This tune also appeared on Diamond Disc number 52637. These two are in better shape than the previous, and if you ask me, the music is too; those last two are just too darned dainty. 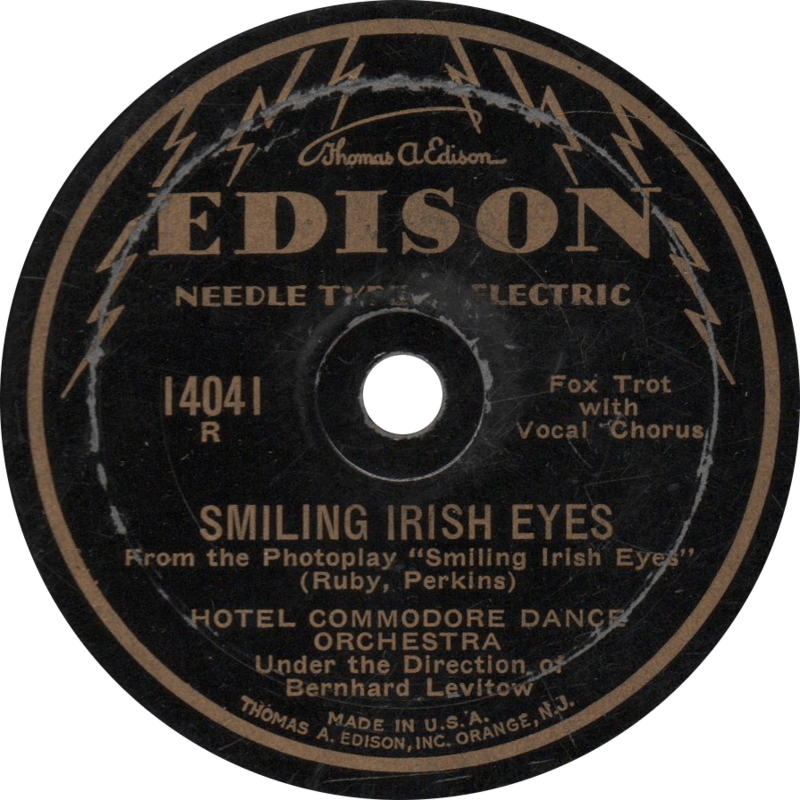 Smiling Irish Eyes, recorded July 18, 1929 by Hotel Commodore Dance Orchestra Under the Direction of Bernhard Levitow. An MCA promotional photo of Baxter, circa 1927 by Bert Studios, Kansas City, Missouri. 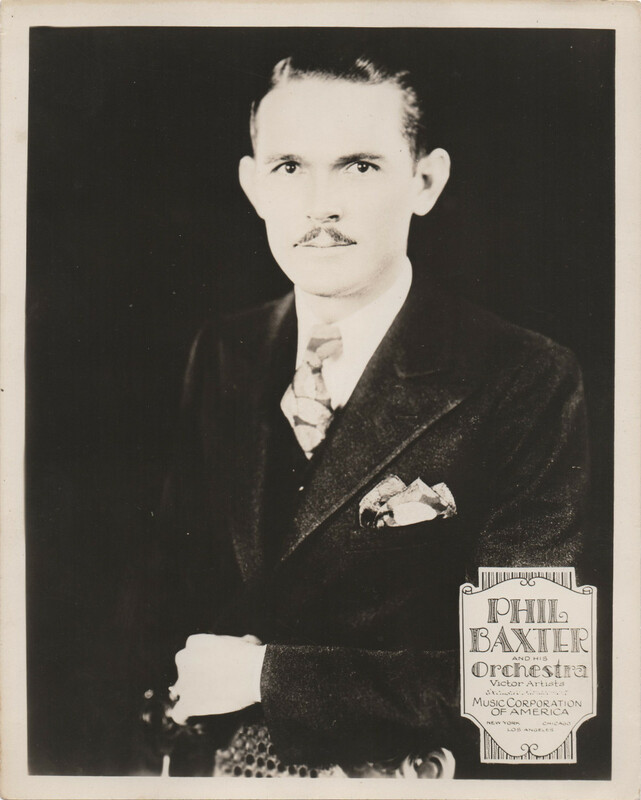 Though perhaps best known as the man who brought into this world such memorable ditties as “Piccolo Pete”, “Harmonica Harry”, and “I’m a Ding Dong Daddy (from Dumas)”, among others, maestro Phil Baxter was also a capable pianist and vocalist, and the leader of a successful Southern-based territory jazz band in the 1920s. Philip Kerley Baxter was born in the small settlement of Rural Shade in Navarro County, Texas on September 5, 1896, twenty miles southeast of Corsicana, the son of Thomas and Lila Baxter, who were at the time making their way via horse and buggy to Palestine (Texas, that is). He served his country in the First World War, and was writing music by 1921 and leading his own jazz band later in the decade. Baxter’s orchestra first recorded in St. Louis, Missouri on October 24, 1925, cutting four titles for Okeh Records, three of which were issued. Around that time, he and Carl Moore published a version of “St. James Infirmary” as “Gambler’s Blues”—Baxter claimed to have co-written the song, but neglected to file for a copyright, which Irving Mills did in 1929 under the pseudonym “Joe Primrose”. Baxter’s orchestra, previously called the “Texas Tommies”, became the house band for El Torrean Ballroom in Kansas City in 1927, broadcasting on KMBC, a post which they retained until 1933. He returned to the recording studio four Octobers after his first session in 1929, when he waxed four further sides for the Victor Talking Machine Company in his hometown of Dallas, Texas, all of which were released that time around, including the noted “I Ain’t Got No Gal Now”. Following the Dallas session, Baxter made no further commercial recordings, though a few home recordings have turned up (which are, most unfortunately, not part of the Old Time Blues collection). The Baxter orchestra continued into the middle of the 1930s. In his later years, his music was hindered by arthritis. Phil Baxter died on November 21, 1972 in Dallas. First, the band plays the magnificent “I Ain’t Got No Gal Now”, a real tour de force, perhaps my favorite jazz side of them all. The band plays here in a style all their own, mellow yet hot, with a loose sort of sound, with accordion that was obligatory in Texas dance bands of the era. Simply a masterpiece! 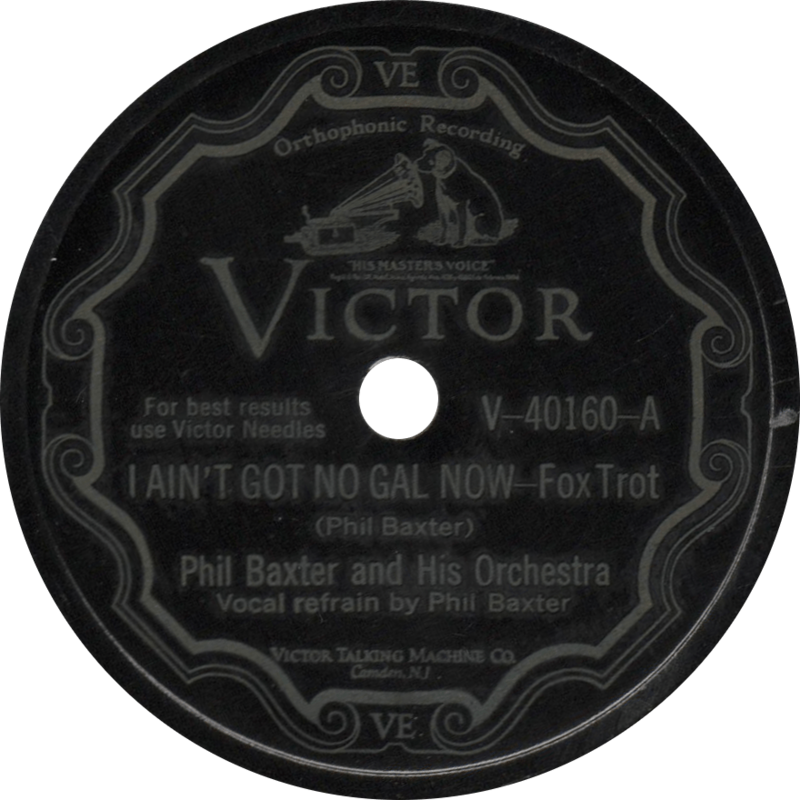 I Ain’t Got No Gal Now, recorded October 20, 1929 by Phil Baxter and his Orchestra. On the reverse, they play a delightful Texas themed number: “Down Where the Blue Bonnets Grow”, another excellent ditty, and with even more accordion! 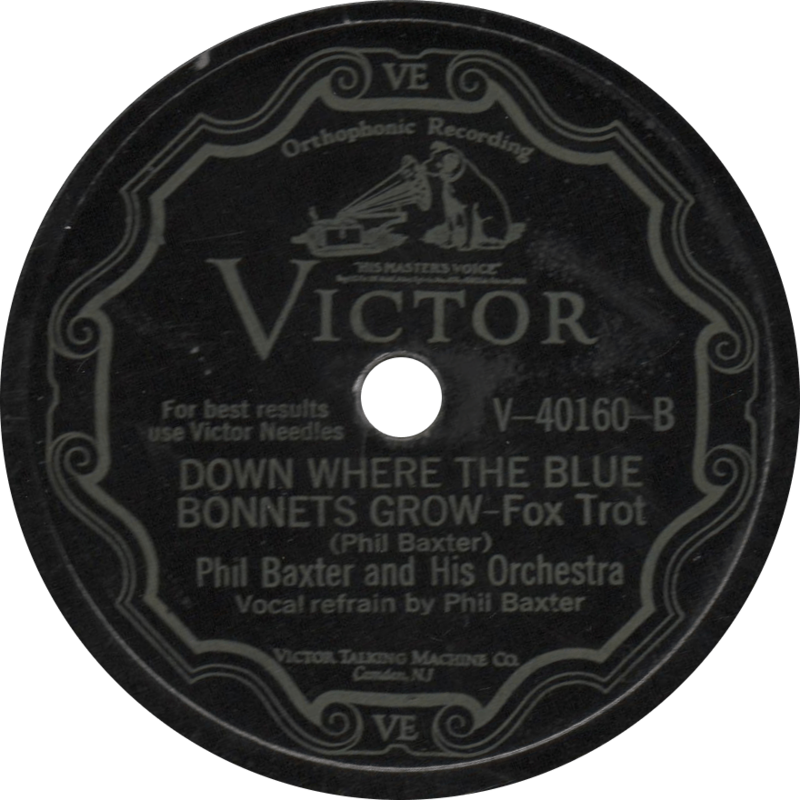 Down Where the Blue Bonnets Grow, recorded Octiber 20, 1929 by Phil Baxter and his Orchestra. 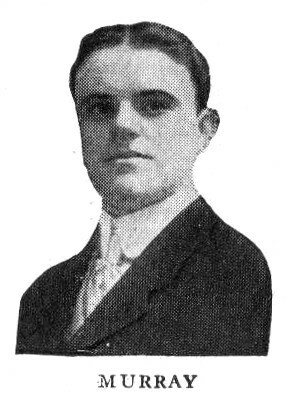 Billy Murray, as pictured in 1921 Victor catalog. In commemoration of the anniversary of the birth of the “Denver Nightingale”, recording pioneer and prolific record artist Billy Murray, I present the latest record of him currently in the Old Time Blues collection. William Thomas Murray was born on May 25, 1877—the same year Edison invented the phonograph that he later would help to proliferate—in Philadelphia, Pennsylvania, son of Patrick and Julia Murray. Murray later quipped, “I squalled for the first time in 1877, and so did the phonograph. I didn’t do very much for ten years after that, but neither did the phonograph.” The Murrays moved to Denver in 1882, and by sixteen, Billy was performing professionally. Murray made his first of hundreds of phonograph recordings for Peter Bacigalupi in San Francisco in 1897, and was recording regularly and professionally in the New York area by 1903. Over the following decades, Murray recorded a huge multitude of songs, in various styles and genres, for virtually every record label in operation. Coinciding with the advent of electrical recording in 1925, the public’s tastes were changing, and Murray began to fall from favor. To adjust to the new recording systems, he softened his singing voice, though his work became more sporadic. In the 1920s, he often worked as a vocalist for dance bands; he appeared on Jean Goldkette’s memorable recording of “I’m Looking Over a Four Leaf Clover” in 1927, featuring Bix Beiderbecke. Starting in the late 1920s, Murray lent his voice to animated cartoons, providing the voice of Bimbo, and others, in shorts made by Fleischer Studios. He worked sporadically on radio through the 1930s, including appearances on the WLS National Barn Dance. In 1940, Murray made a series of recordings for Bluebird, accompanied by Harry’s Tavern Band, and made his last recordings in 1943 for the Beacon label with fellow recording pioneer Monroe Silver, known for his “Cohen” character. After retiring in 1944 due to heart issues, Billy Murray died suddenly of a heart attack at a Guy Lombardo show on Long Island on August 17, 1954. 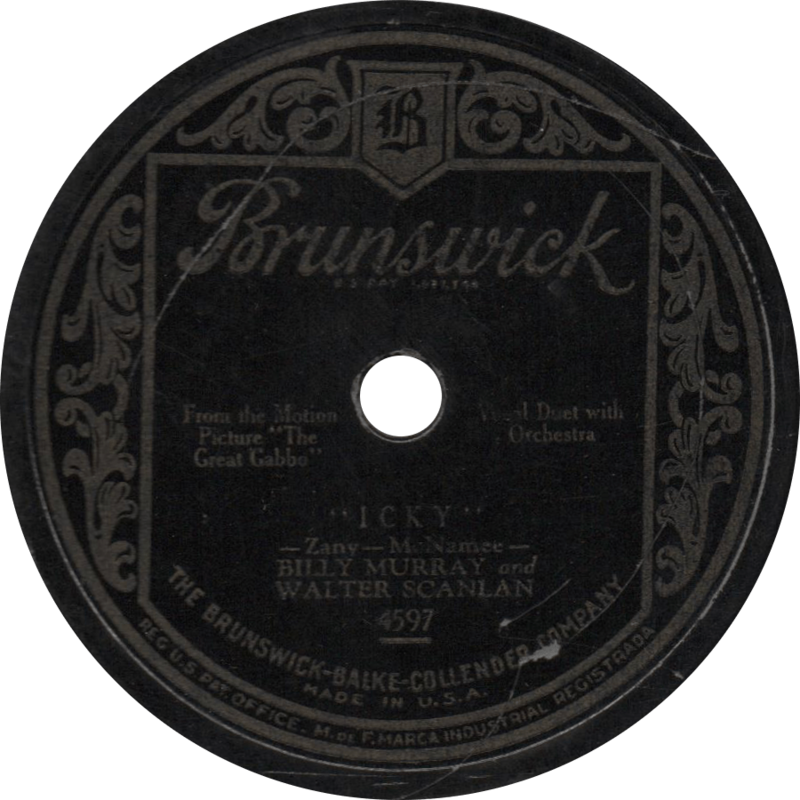 Brunswick 4597 was recorded in September or October of 1929 by Billy Murray with his frequent duet partner Walter Scanlan (whose real name was Walter van Brunt). First, the duo sings humorous number from the 1929 Sono Art-World Wide talking picture The Great Gabbo, in which it was performed by Erich von Stroheim in the titular role, with his ventriloquist dummy. Icky, recorded September/October 1929 by Billy Murray and Walter Scanlan. On the reverse, Murray and Scanlan sing another comic song most frequently associated with Eddie Cantor, “My Wife is On a Diet”. 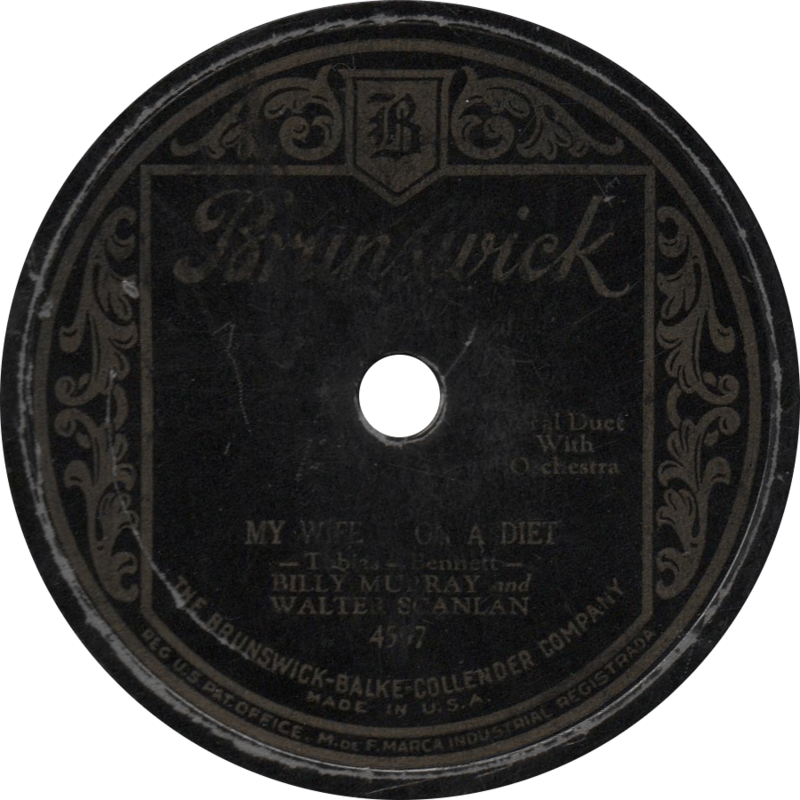 My Wife is On a Diet, recorded September/October 1929 by Billy Murray and Walter Scanlan. A portrait of a young Ellington. Circa late 1920s. Last time we commemorated the anniversary of the birth of the legendary Duke Ellington, born April 29, 1899, with his famous “It Don’t Mean a Thing (If it Ain’t Got That Swing)”; this time we celebrate with one of his classic hot jazz records of the 1920s. Ellington’s life has already been covered in that post, so I needn’t go over it again in this one. 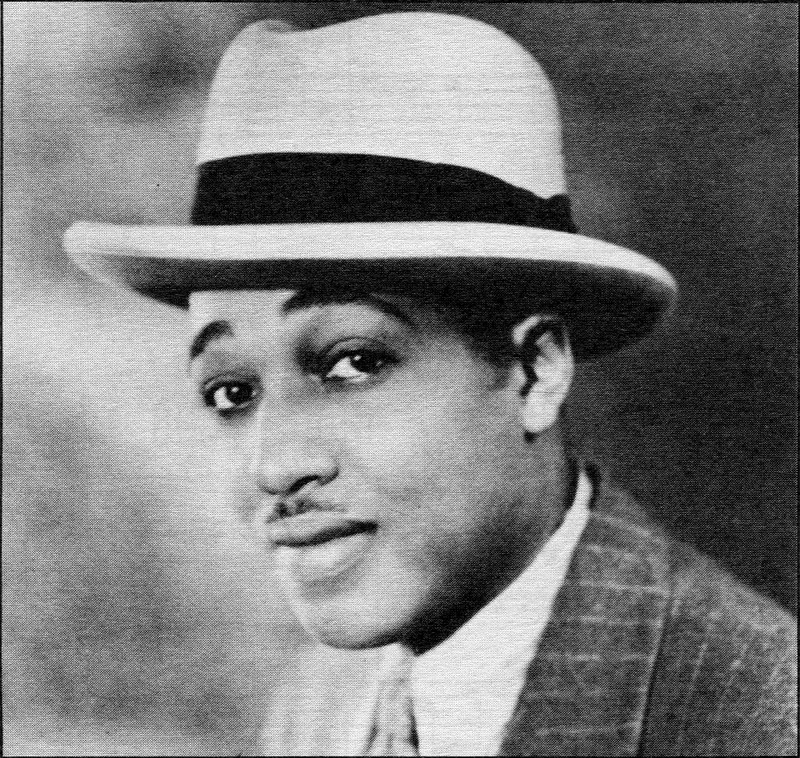 Duke Ellington made his motion picture debut in 1929, along with Fredi Washington of Imitation of Life fame, in the Harlem Renaissance jazz film Black and Tan (see here for an exceptional transfer of the film on YouTube). In it, Ellington plays a down-on-his-luck bandleader, whose ailing girlfriend—played by Washington (whom he was reportedly dating in real life at the time)—finds him employment at a nightclub, where she succumbs to her illness while performing a dance routine. Ellington and his band play such jazz classics as the titular “Black and Tan Fantasy”, “Black Beauty”, “The Duke Steps Out”, and “Cotton Club Stomp”. Not too long after, Duke and his band traveled to Hollywood for their first “big time” movie appearance in the Amos ‘n’ Andy feature Check and Double Check. One of only a handful of films of that type, I fully recommend viewing Black and Tan. Victor V-38079 was recorded on May 3, 1929 in New York City. Ellington’s Cotton Club Orchestra is made up of Arthur Whetsel, Cootie Williams, and Freddie Jenkins on trumpet, “Tricky Sam” Nanton on trombone, Barney Bigard on clarinet and tenor sax, Johnny Hodges on clarinet, alto sax, and soprano sax, Harry Carney on clarinet, alto sax, and baritone sax, Duke Ellington on piano, Fred Guy on banjo, Wellman Braud on string bass, and Sonny Greer on drums. First up, Ellington and the boys get hot on the outstanding “Cotton Club Stomp”. This stomp is one of the pieces played by Ellington and his orchestra in Black and Tan, in which it is danced by Fredi Washington. 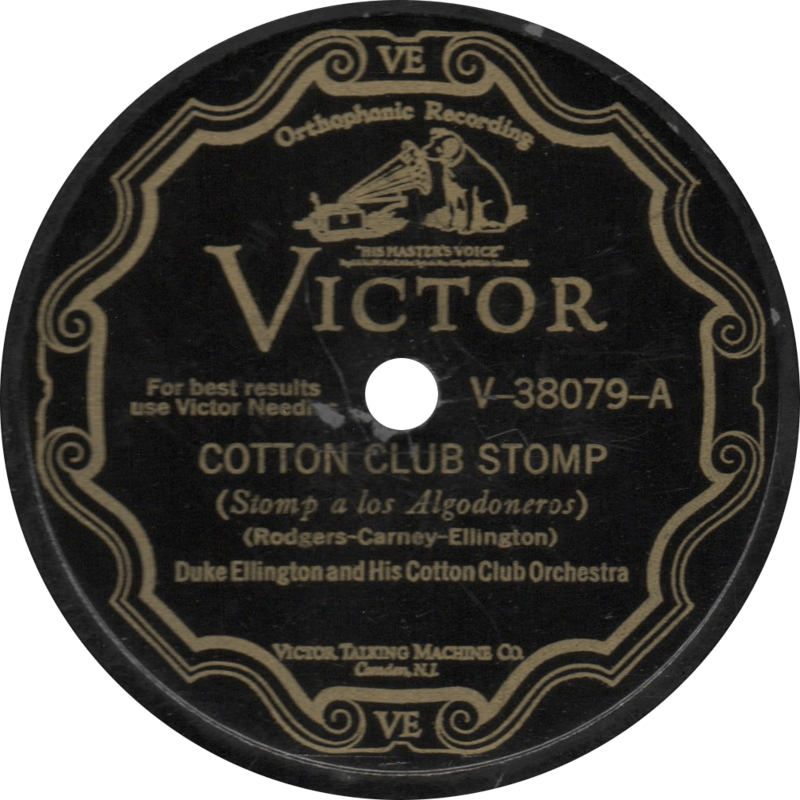 , Cotton Club Stomp, recorded May 3, 1929 by Duke Ellington and his Cotton Club Orchestra. Next, they play a late oriental fox trot, “Arabian Lover”, from the Cotton Club Revue. 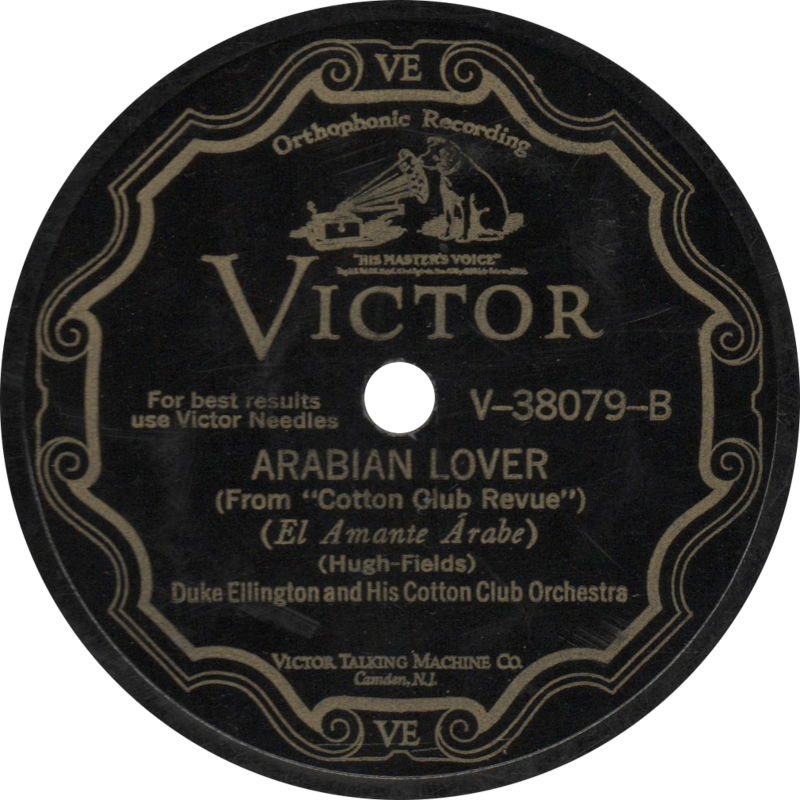 Arabian Lover, recorded may 3, 1929 by Duke Ellington and his Cotton Club Orchestra. Continuing in out tradition of honoring music heroes of the 1920s and ’30s, today we remember Andy Kirk, on the 118th anniversary of his birth. Andrew Dewey Kirk was born May 28, 1898 in Kentucky, but soon relocated to Denver, Colorado, where he spent his early years. In Denver, Kirk was instructed by Wilberforce Whiteman, father of Paul Whiteman, learning to play saxophone and tuba. He started his career as a professional musician with George Morrison’s band, before moving on to Terrence Holder’s Dark Clouds of Joy. Holder left the band in 1929, and Kirk assumed leadership, moving the group from Dallas to Kansas City, and renaming them the Twelve Clouds of Joy. In Kansas City, Kirk’s Twelve Clouds of Joy gigged at the Pla-Mor Ballroom, and made their first recordings, with Mary Lou Williams on piano, in November of 1929 during a Brunswick field trip, followed by several more the next year. In 1931, Kirk picked up Blanche Calloway as a vocalist, and made several more records under the guise of “her Joy Boys”, after which he stopped recording for several years. He reemerged in 1936 with a hep swing band and a lucrative contract with Decca, with the Twelve Clouds of Joy becoming one of most successful territory bands, and in some regards, the successor to a position held by Bennie Moten’s Kansas City Orchestra. When Billboard began charting hit records, his “Take It and Git” was the first to chart on the “Harlem Hit Parade”. Kirk gave up music in 1948, instead turning to a career in real estate and hotel management. He died in 1992 at the age of 94. Brunswick 4653 was recorded on November 7 and 8, 1929 in Kansas City, Missouri. From Kirk’s first and second sessions, and his first issued record. The Twelve Clouds of Joy are comprised of Gene Prince and Harry Lawson on trumpets, Allen Durham on trombone, John Harrington on clarinet and alto sax, John Williams on alto sax and baritone sax, Lawrence ‘Slim’ Freeman on tenor sax, Andy Kirk on bass sax and tuba, Claude Williams on violin, Mary Lou Williams on piano, William Dirvin on banjo, guitar, Edward McNeil, drums. First, the band plays Mary Lou Williams’ hot jazz arrangement of “Casey Jones”, styled here as “Casey Jones Special”. I’ve always loved that brief interjection of country fiddle before going right back into jazz. 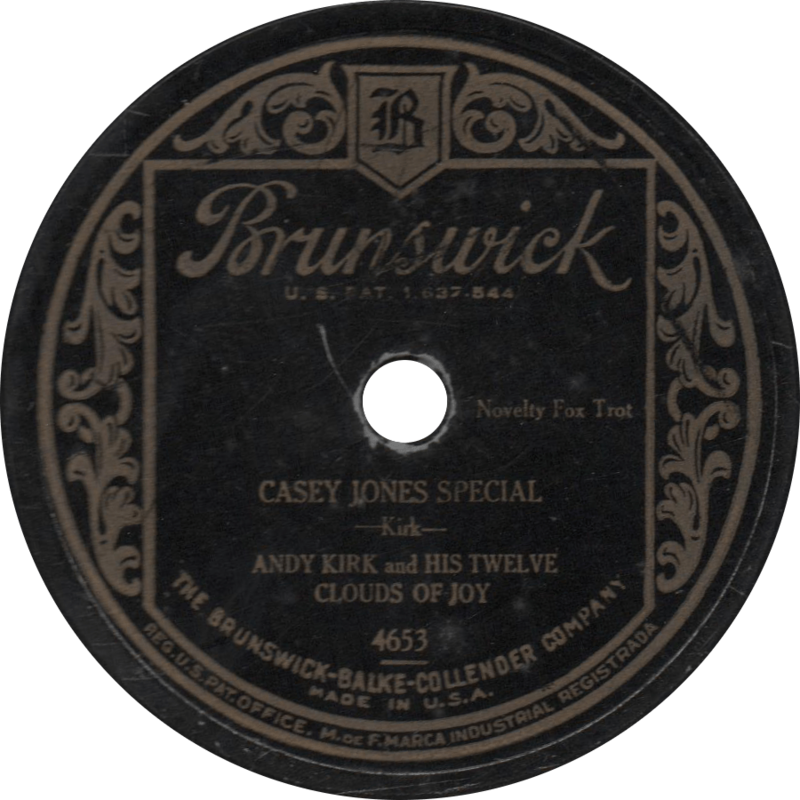 Casey Jones Special, recorded November 8, 1929 by Andy Kirk’s Twelve Clouds of Joy. I’m not sure if “Cloudy” was the official theme song of the Twelve Clouds of Joy, but it ought to have been if it wasn’t. They recorded this tune again for Decca in 1936, with a vocal by Pha Terrell. 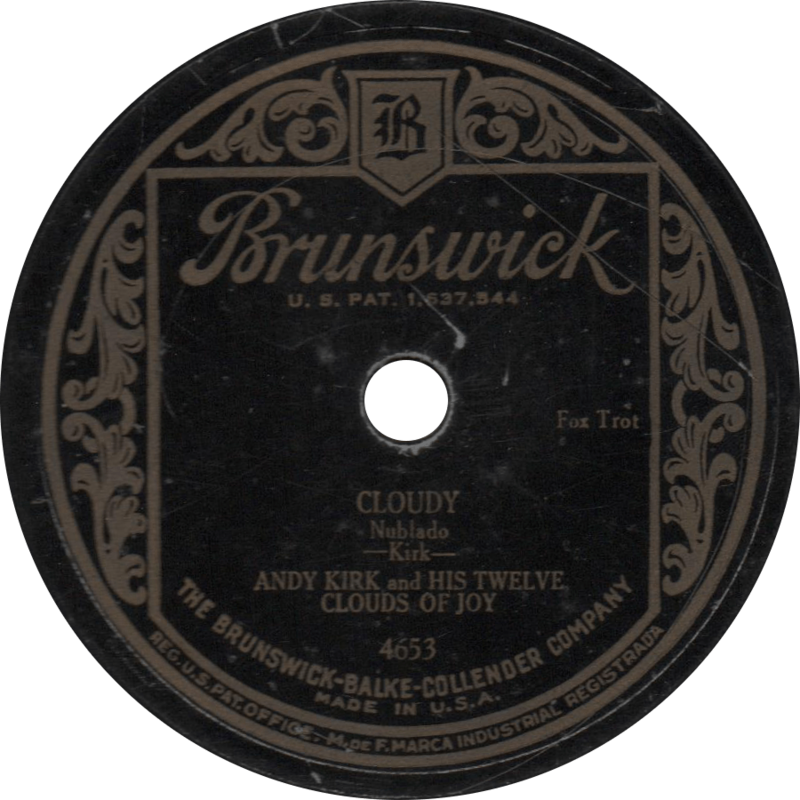 Cloudy, recorded November 7, 1929 by Andy Kirk and his Twelve Clouds of Joy. Oh, here’s old daddy Cleaton, let his name forever be, and long be remembered in the courts of Tennessee. For he is a good old rounder till the curtain ’round him fall. He’ll be carried back to victory on the Wabash Cannonball.